This is a comparison between two 1xAAA flashlight that is small enough to go in a jean pocket for EDC. I owned both of these flashlights, I got the FOURSEVENS Preon 1 at first and then lost it during a trip. Now I own the Thrunite Ti3, and I’m much happier with the Ti3. 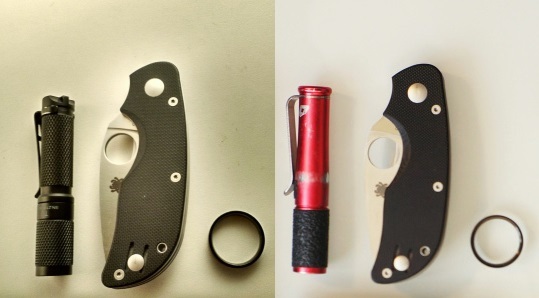 Here are photos of the two flashlight beside the same knife (Spyderco Cat) and ring. The Preon 1 is slightly longer (0.2″). Thrunite Ti3 (left) and FOURSEVENS Preon 1 (right) besides Spyderco Cat and my ring. Very similar in size. Forewarning, I’m not a flashlight geek who deals intimately with lumens, candela, flux, throw…I care about ease of operation, construction, and having a solid low and high setting for brightness.